People in mid-life are often encouraged to plan financially for their later years. However there’s little resource or knowledge on how to plan emotionally and psychologically for this time. Transitions such as retirement, moving out of the family home or a deterioration in health are often difficult. They can for example, lead to loneliness and isolation which impacts on mental and physical health. Support to help older people deal with difficult transitions tends to be disjointed, patchy and is often only arranged in a crisis. There is a real need to shift from firefighting to prevention, with a holistic, person-centred approach to this issue. One that starts before the problem begins to occur and which builds people’s resilience and therefore their ability to cope with difficult transitions. 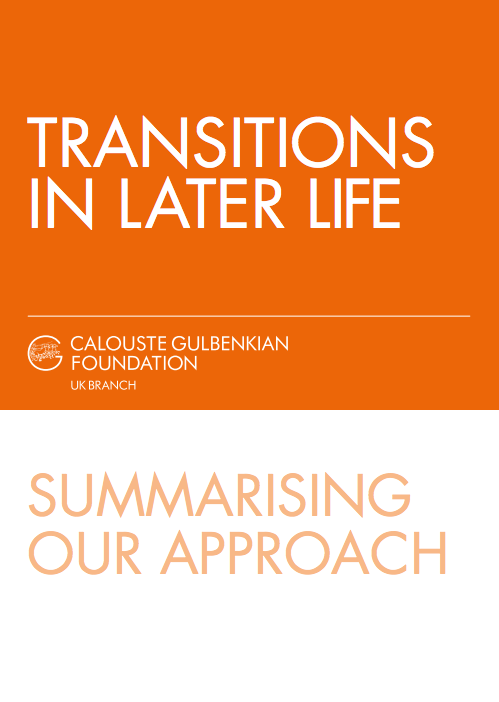 When we were planning our five year Transitions in Later Life programme, research indicated that resilience is strongly related to an optimistic outlook on life, and that there are modern therapeutic approaches which essentially ‘teach’ it. We have been supporting organisations to test interventions that use tools such as Mindfulness training, Cognitive Behavioural Therapy and Positive Psychology at the stage in life just before retirement. With these, we endeavour to build the evidence base surrounding what works in managing what is potentially a destabilising and distressing transition. We have been sharing our learning and insights through publications and a learning community of practitioners. Collaborating with those pioneering in this field, and with the Centre for Ageing Better as our research and evaluation partner, we have been working with employers, health bodies and policy-makers. Together we hope to create best practice in well-planned and successful retirements, which will greatly minimise the loneliness and isolation suffered by older people. Our ambition is to ‘future-proof’ chronic health and social issues in later life. We believe we will help to bring about major social change if people in mid and later life are supported to develop the coping skills they need to manage transitions as they age. Cross-sector partnerships that enable greater investment in this field. The Centre for Ageing Better is a supporting partner on the Transitions in Later Life programme. Together we are testing the effectiveness of well-known therapeutic approaches, such as mindfulness and cognitive behavioural therapy, with people preparing for retirement, as well as developing and testing new methods of support to help improve wellbeing and resilience for the population as they age. Using learning from evidence and evaluation, we are working together to influence employers and other service deliverers to bring to scale the ideas that work, in order to reach more people managing changes in later life. These partners applied to be part of our learning community through our Open Fund. A locally based mental health charity delivering a range of interventions to alleviate some of the key risk factors for poor mental health. Manchester Mind delivers six week interventions based on positive psychology and CBT to equip participants with specific skills that are proven to improve people’s mental wellbeing and develop resilience. test new approaches for improving the quality of life for people as they age. It is training volunteer peer coaches in Cognitive Behavioural Therapy (CBT) and mindfulness techniques which they will use themselves and also cascade out to the wider population of older people. An Irish national organisation which inspires and empowers people to live healthy and fulfilling lives, with a goal of turning the period from age 50 onwards into one of the most satisfying times of life. Age & Opportunity are developing and testing a new programme (including materials and a range of delivery methodologies) that will build resilience in people aged 50+ to enable them to navigate later life transitions. To improve the mental and emotional wellbeing and resilience of their staff, CWP runs a practical and thought provoking two-day, person-led workshop aimed at NHS support staff aged between 50 and 75. The workshop will provide tools and techniques to increase wellbeing, identify positive emotion, maintain positive relationships, and develop meaning and a sense of accomplishment. emotional and psychological aspects of ageing with the intended outcome of enabling older people to increase their resilience to the challenges of later life. Innovation Unit (IU) is a not-for-profit, mission-driven organisation working to create radically different, better and lower cost public services. Over the next 6 months IU will prototype a range of solutions aimed at improving wellbeing during retirement and later life. Building on the substantial evidence that already exists, by the end of 6 months IU aims to have the blueprint for a universal service that has the support of both users and potential delivery partners. Tavistock Relationships supports and improves the quality of couples’relationships by building resilience and strengthening the ability of the couple to act as a protective resource. Its project aims to develop a replicable pilot model for a preventative relationship ‘MOT’ check-up for 50+ couples, involving face-to-face sessions and a video addressing relevant issues. working with Citizens Advice on an in-depth research project that seeks to understand what barriers people face when planning for later life, in advance of the state pension age. Since 2014, we have supported the development of the Retirement Transition Initiative, a programme that seeks to equip people with the information, networks and opportunities to enter retirement with confidence. During 2015 we supported six pilots of the weekend programme in three locations attended by a total of 180 people. As well as an additional one-day pilot delivered in Southampton targeted specifically at people on low income. We are now supporting the Retirement Transition Initiative to move from pilot towards a sustainable social enterprise, Envisage, which is ready to scale. We are a development partner for Social Finance’s Reconnections Social Impact Bond, which is a service set up in 2015 aiming to make loneliness less severe for 3000 older people in Worchestershire. This is the country’s first Social Impact Bond to deal with loneliness, presenting an important opportunity to establish best practice in social isolation. The Age Of No Retirement seeks to give retirement new meaning and inspire thousands of people to rethink their futures and aspire to greater fulfilment and purpose in life. In October 2014 we supported an inaugural two-day event in London, featuring a series of debates to generate new insights and ideas, exploring the hidden value inherent within a society in which people are living longer, healthier and more productively than ever before. Following the success of this first event, The Age Of No Retirement hosted an event in Manchester in April 2015, with more than 200 participants and converted the ideas into innovative and implementable prototypes that could produce real and measurable social impact. During 2016-17 there will be a series of high profile events and campaigns, including a four day “Age Does not Matter” event in September 2016.